When vegetative cells of certain bacteria such as Bacillus spp and Clostridium spp are subjected to environmental stresses such as nutrient deprivation, they produce metabolically inactive or dormant form-endospore. Formation of endospore circumvent the problems associated with environmental stress and helps them to survive. During unfavorable conditions (especially when carbon and nitrogen become unavailable) endospores can form within different areas of the vegetative cell. They can be central, subterminal, or terminal. Central endospores are located within the middle of the vegetative cell. Terminal endospores are located at the end of the vegetative cell. 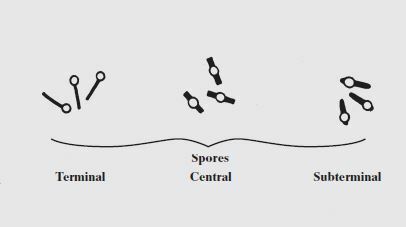 Sub-terminal endospores are located between the middle and the end of the cell. Most endospore forming bacteria are found in soil or aquatic environments. 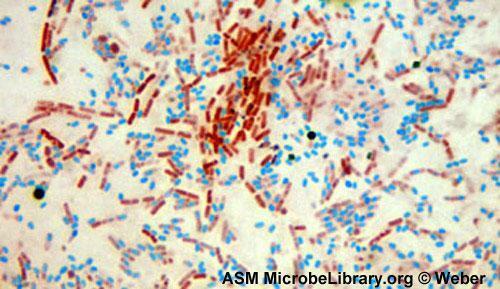 However, some species of Bacillus and Clostridium have medical significance. Clostridium perfringens, C. botulinum (a potential agent of bioterrorism) and C. tetani are the causative agents of gas gangrene, botulism and tetanus, respectively. Bacillus anthracis and Bacillus cereus are the causative agents of anthrax and a self limiting food poisoning, respectively. A differential staining technique (the Schaeffer-Fulton method) is used to distinguish between the vegetative cells and the endospores. A primary stain (malachite green) is used to stain the endospores. Because endospores resist staining, the malachite green will be forced into (i.e, malachite green permeate the spore wall) the endospores by heating. In this technique heating acts as a mordant. There is no need of using any decolorizer in this spore staining as the primary dye malachite green bind relatively weakly to the cell wall and spore wall .In fact If washed well with water the dye come right out of cell wall however not from spore wall once the dye is locked in. Water is used to decolorize the vegetative cells. 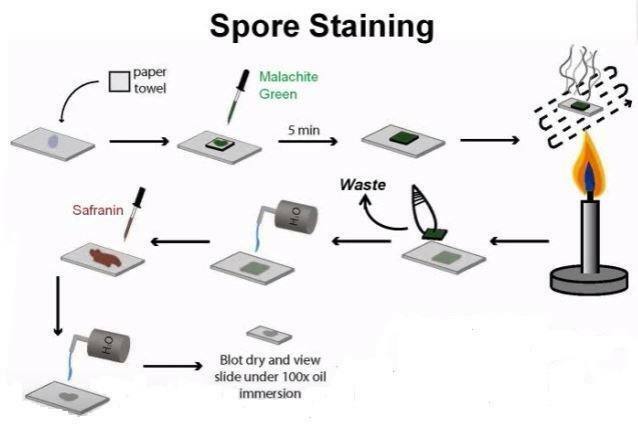 As the endospores are resistant to staining, the endospores are equally resistant to de-staining and will retain the primary dye while the vegetative cells will lose the stain. The addition of a counterstain or secondary stain (safranin) is used to stain the decolorized vegetative cells. the vegetative cells that contain endospores should stain pink while the spores should be seen as green ellipses within the cells. Mature, free endospores should not be associated with the vegetative bacteria and should be seen as green ellipses. Prepare smears of organisms to be tested for presence of endospores on a clean microscope slide and air dry it. Place a small piece of blotting paper (absorbent paper) over the smear and place the slide (smear side up) on a wire gauze on a ring stand. Heat the slide gently till it starts to evaporate (either by putting the slide on a staining rack that has been placed over a boiling water bath or via bunsen burner). Remove the heat and reheat the slide as needed to keep the slide steaming for about 3-5 minutes. As the paper begins to dry add a drop or two of malachite green to keep it moist, but don’t add so much at one time that the temperature is appreciably reduced. # DO NOT OVERHEAT. The process is steaming and not baking. Remove the blotting paper and allow the slide to cool to room temperature for 2 minutes. Rinse the slide thoroughly with tap water (to wash the malachite green from both sides of the microscope slide). Stain the smear with safranin for 2 minutes. Rinse both side of the slide to remove the secondary stain and blot the slide/ air dry. Observe the bacteria under 1000X (oil immersion) total magnification. Results: The vegetative cells will appear pink/red and the spores will appear green. Thank you so much for visiting my blog and for your inspirational comment. Can you please clarify about this section of your comment “do write time and reagents”. I will be looking forward to hear from you. Wishing you great time ahead. What is the correct way to cite this page? why does water decolorise vegetative cells but not endospore? Thank you so much for your question. It’s a very good question so I have incorporated the answer in the blog post as it may help other students as well. The reasons are; Malachite green is water soluble, vegetative cells have been disrupted by heat. why do anaerobic bacterias die in the presence of oxygen where as aerobic bacteria do not? what is the significance factor that causes this to be so? thanks for the willingness to help…. Dear Ankit, we use paper towel to give more contact time between the dye and the bacterial cells. If paper towel is not used, the dye evaporates quickly. Tell me please, what concentration of malachite green and safranin do you use? Are 1% water solutions suitable? what is a benefits ethyl alcohol in gram staining sir? your site is great. I always come here first. keep it up.